We don’t actually recommend this. Real answer: Those are fly masks, and they protect the horse’s eyes and ears from biting flies. Plus, they also provide some UV protection for the eyes. Sarcastic answer: We’re teaching them to hone in their other senses. Plus, when they get old and go blind, they’ll be trained for it. Real answer: Some horses live in stalls in barns when they’re not turned out or the weather is inclement, while others are happy to live outside in any weather as long as they have a three-sided shelter or natural windbreak to access. Sarcastic answer: We bring them inside, silly. They make great smugglers, and fit perfectly in a king-sized bed. California King, to be exact. Real answer: The average adult horse eats around 15 to 20 pounds of hay a day, plus grain to supplement their nutrition. Sarcastic answer: 37 cheeseburgers a day, to be exact. Real answer: We compost the manure and then spread it on farm pastures to enrich the soil — naturally! Sarcastic answer: We sell it to Walmart. They pay 27 cents a pound. But if you want some, I’ll give it to you… for free! Real answer: Given the choice, most horses would probably rather eat, but horses generally enjoy going to work and the exercise is important for their health. Sarcastic answer: Yes, but they prefer to do the dishes and laundry. Real answer: The science is a little mixed on this, but our horses certainly seem to recognize us! Or at least they recognize that we’re bringing them food. Sarcastic answer: Yes, he even memorized my telephone number in case of emergencies. 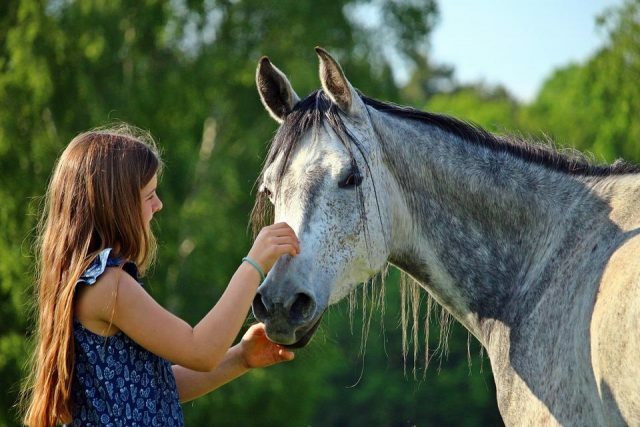 Real answer: With good care and genetics, horses can live into their mid-twenties or even early thirties. Sarcastic answer: Long enough to blow through our 401k and leave us with nothing. Real answer: Some horses are prone to naturally soft or brittle feet that require shoeing, but many horses can go barefoot depending on their care, health, genetics and workload. Sarcastic answer: Yes, and they can also go naked. Real answer: The hoof wall is insensitive, so the horse doesn’t feel any pain when the nail is driven in as long as it’s placed correctly. It probably feels about the same as trimming your own fingernails. Sarcastic answer: The pain helps them run faster. It’s common logic. Real answer: I’m not insured for anyone else other than me to ride my horse and my horse isn’t well-suited for giving riding lessons. But here’s the phone number of a great barn down the road that specializes in youth lessons! Sarcastic answer: Can I borrow your car? I love to drive erratically while drinking bourbon.